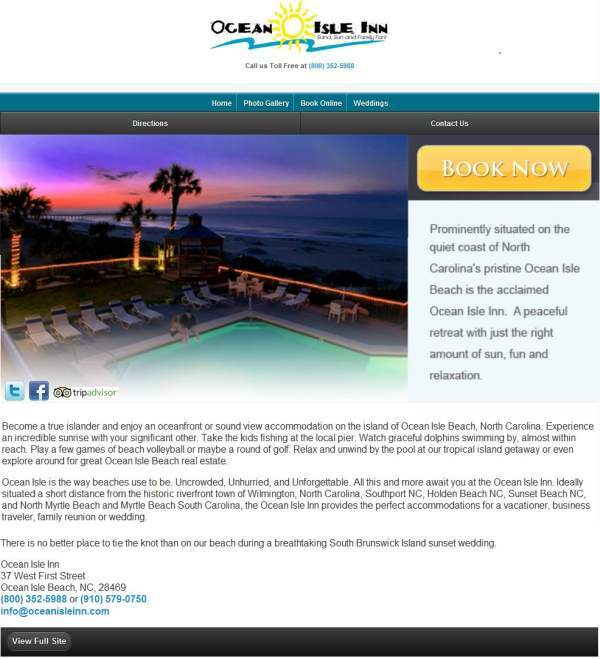 We recently launched the Mobile site of Ocean Isle Inn of North Carolina. The upgraded website, designed by InterCoastal Net Designs, can be accessed by mobile device users. Contact forms have been added to the site as well as a complete photo gallery. The Mobile site links out to the Ocean Isle Inn online booking system so guests can make their reservations by phone from anywhere. The .Mobi sites are the marketing “must-haves” of today. If your company doesn’t already have one, you should be talking to ICND about it. The facts tell us that there are twice as many mobile phones in the world as there are television sets, and four times as many mobile phones as there are computers. .Mobi sites are optimized for viewing on a mobile phone, providing the major advantage of the domain of compatible content. The Ocean Isle Inn website has been optimized for the special capabilities and restrictions of mobile devices, such as smaller screens, device form/size, device input/output options, existence of embedded sensors (acceleration, location, touch, etc. ), as well as human factors such as expectations of immediacy of results, context awareness under a shortened attention span (as opposed to the home use of the Internet). Although other top-level domains can technically employ the same optimizations for mobile phones, only a fraction of them do, thus necessitating the content adaptation solutions. These retrofit the content to target devices independent from the original process of creating the site. Ocean Isle is the way beaches used to be. Uncrowded, unhurried, and unforgettable. All this and more await you at the Ocean Isle Inn. Ideally situated a short distance from the historic riverfront town of Wilmington, NC, and Myrtle Beach, South Carolina, the Ocean Isle Inn provides the perfect accommodations for a vacationer, business traveler, family reunion or wedding.